I received an Advanced Reader Copy of this book in order for my honest review.I will admit that I received it a couple of months ago, but have had several other books on my plate and it took me awhile to get to to it. 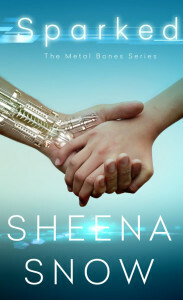 Sparked is the first book of the Metal Bones Series by Sheena Snow. 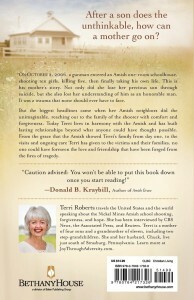 Here is the book’s description. No need for me to explain it all again when it’s already written! Sheena Snow, contrary to her name, lives in South Florida and has only seen snow once. But she would love for it to land on her eyelashes and sparkle in her hair. She loves painting, candle making, orchid shows, tattoo conventions, hockey games and library book sales! 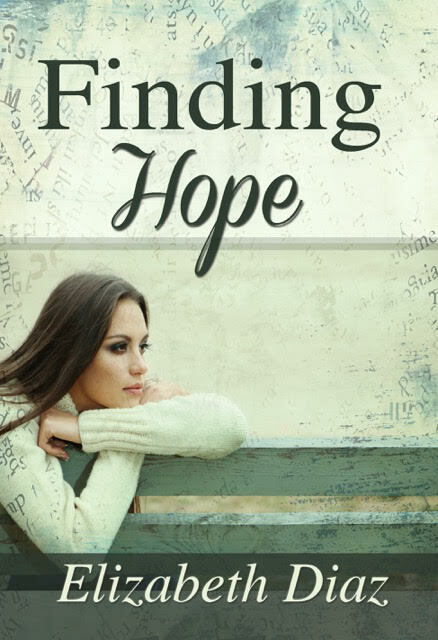 After college she landed a full time job but kept serving pizza on the weekends and writing stories about characters she wished really existed, characters who never gave up no matter the obstacles life threw at them. 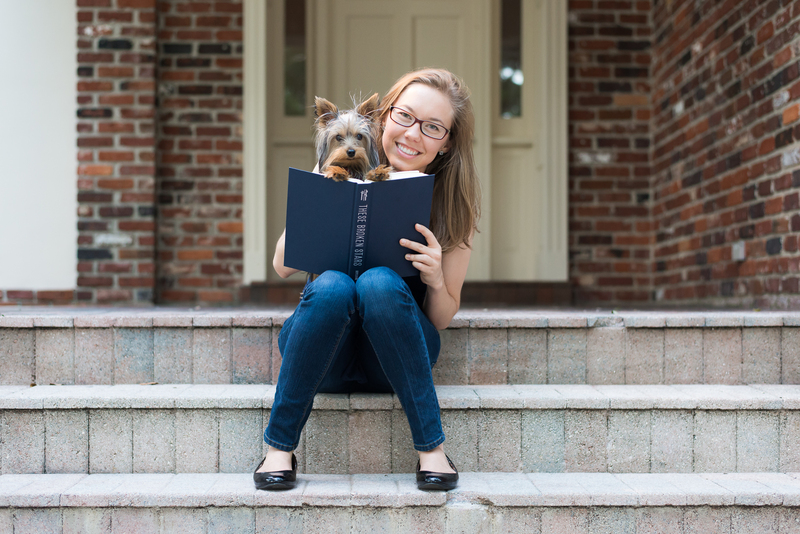 At the age of twenty-six, she sold her first book and bought her very first puppy, a wonderful Yorkie named Aladdin. So I would say this book would be classified as a sci-fi, young adult, romance, action/adventure. That might seem like a lot of categories, but not really, considering it is sci-fi. I liked the idea behind the book, that there is some shady government ops regarding robots and AI (artificial intelligence) and such. There were a few things that didn’t really draw me in. Maybe that can be explained by the fact that I am not a young adult, and that is who the book is geared toward. I found the main character Vienna hard to relate to, and I like to feel that connection when reading a book. Although I see now that her age is mentioned in the book’s description, I personally thought she seemed much younger than eighteen until there was more depth to the romance scenes. She seemed a little immature for eighteen. I also felt that it wasn’t really explained well why people were after Vienna in particular. Perhaps that is something to look for in the second book? I also personally found some of the “arguing with the voice in her head” scenes a little repetitive. We get it. She is distrustful of robots. And a slight mistake when Vienna reserves to one of the robots as “Bonnie” before she actually has given them their human names. Oh well. Also, Green Eyes/Alec starts calling Vienna “Baby” way too often for my liking. Now, I’m not a terms of endearment hater, it just seems a little over the top. There are some great action scenes and the description of Green Eyes/Alec does make him believable as a love interest. Yum! I also noticed similarities to the Twilight Saga in this book, especially in the fact that Alec has some sort of way of knowing that Vienna is the one for him, sort of like “imprinting” in Twilight. I don’t mind that though. I like Twilight, and there are enough differences that it doesn’t seem like a copycat job or anything like that. So, yes I will say that this is a worthy read and I will keep you updated if I get the chance to read the rest of the story later on. Come on Vienna, make me love you in Enflamed! Recently I read the book Roadkill by UK author Daisy White. Now, don’t be put off by the title. I initially thought it was a horror book, but once I read the description and subsequently the book, it most definitely is not. It is a mystery, perhaps a thriller as well. It is geared towards young adults, and although I am past that age group, I enjoyed it anyway. Eighteen year old Caz is struggling to come to terms with the death of her older sister Rose, who died in a supposed hit and run accident. 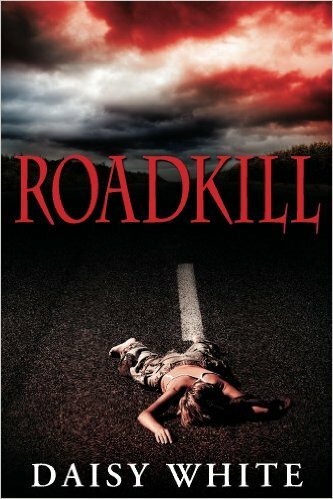 Caz is determined to find the driver who killed her sister, and discovers Rose was involved in a dubious social networking site for thrill-seekers; LIVEWIRE. The length of this book definitely makes for a fast and easy read, which is probably fairly common for a book geared toward young adults. It’s been a while since I was a young adult so I don’t totally remember! There were a couple of transitions from scene to scene, or where Cas is having a memory, where I got slightly confused and had to go back and re-read a couple of times until I found a way that it made sense. And to be honest, I had an inkling who the killer was early on, but couldn’t suss out why. So although not completely unpredictable, I will still in a bit of suspense waiting for that explanation. There were a few phrases that were a little bit foreign to me, but that can be explained away because they author is from the UK and I am from the US! In general, I would say the book is well-written. I definitely wanted to finish it without setting it down once I started. I would certainly read other books by this author if given the opportunity. The characters are well-developed and described in a way that you can actually envision them in your head. I received an advance reader copy of this book in exchange for my unbiased review. Recently I was given the opportunity to review the book Forgiven: The Amish School Shooting, a Mother’s Love, and a Story of Remarkable Grace. 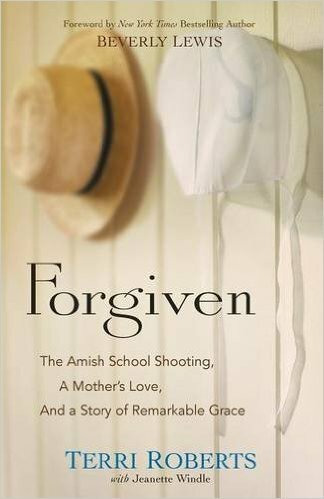 This is a true story, dealing with the shooting that happened in October of 2006 at an Amish schoolhouse in Pennsylvania. On that day, a man entered the school, shooting ten young girls. Five of those girls passed away and the shooter also ended up taking his own life. Many people most likely recall the story, at least to some extent. This story is related from the point of view of the shooter’s mother. 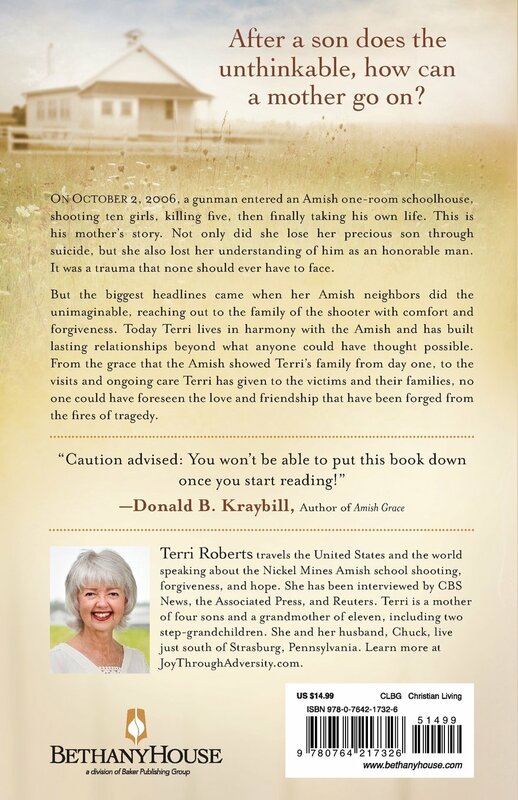 At times, it is a difficult read, emotionally as you experience Roberts’ pain over the loss of her son, and also dealing with the horrible thing that he had done. However, the story is a one of hope and God’s grace. 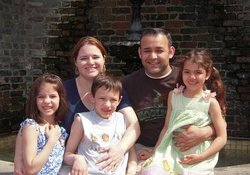 Terri takes us back to the beginning, when her son was born and leads us up to the day of horrible event. 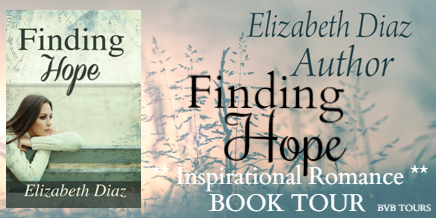 She takes us through her journey with her own health problems and how she formed a lasting connection with the very Amish families that were affected by what her son had done. This is definitely a book to pick up. We don’t often hear the story from this perspective, as many times only the direct victims voices are put out to the media. 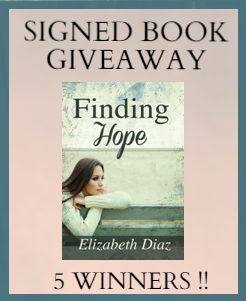 I received a free copy of this book from Bethany House for the purpose of this review. Find this book on Amazon HERE. I’ve decided to post a couple of book reviews here for fun. I have to read the books first though! The first one will be Duct Tape 911: The Many Amazing Medical Things You Can Do to Tape Yourself Together by James Hubbard, MD. The doctor is mailing me a copy of the book and I also planning on interviewing him about the book when I am done. 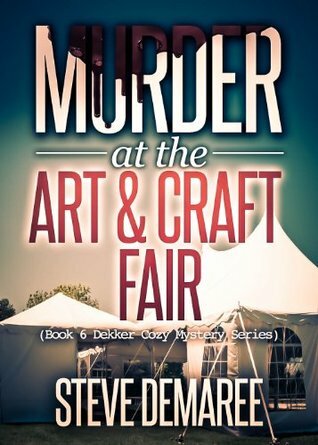 And then, just for fun, I am also going to read and review a fiction piece, Murder at the Art and Craft Fair by Steve Demaree.